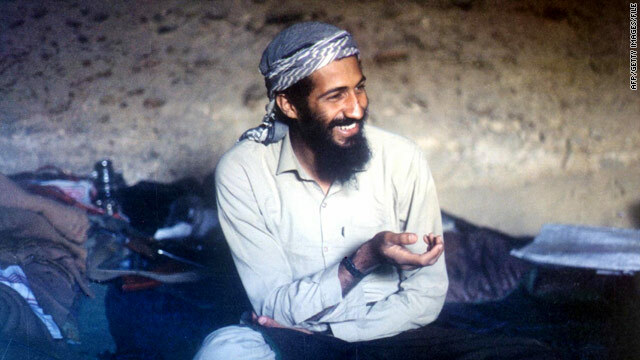 Osama bin Laden, al Qaeda's leader, seen in an undated photo. [Updated at 10:33 p.m.] Vice President Joe Biden commended the team responsible for taking down Osama bin Laden in a stealth operation that showed "there's no place you can hide" from the United States. "It was a staggering undertaking and there was no one else, I believe, other than an American group of military warriors who could do it. And the world is a safer place today, not only for the American people but for all people," Biden said in a speech at the 2011 Atlantic Council Awards Dinner in Washington. He also said he was a little surprised by the overwhelming global reaction and offered prayers to victims of terror worldwide. "They remain in our thoughts and our prayers. But I think one clear message has gone out to the world - there’s no place to hide, no place you can hide. The United States decides, from one administration to the next, that we will in fact reach a goal, we are determined and we will relentlessly without any hesitation follow on that commitment. Democrat, Republican, it doesn’t matter." [Updated at 7:08 p.m.] CIA Director Leon Panetta said Tuesday he thinks a photograph of Osama bin Laden's body will be released at some point, but that it is up to the White House to make the final call. [Updated at 6:39 p.m.] A few U.S. congressional staffers who received a briefing Tuesday about the raid that killed Osama bin Laden in Pakistan were shown photos of bin Laden's body, a congressional source familiar with the briefing said, according to CNN congressional producer Deirdre Walsh. One staffer who reviewed the photos suggested they might be too graphic for public release, according to the source. U.S. officials are weighing whether to release an image of bin Laden's corpse. [Updated at 6:18 p.m.] A widely distributed photo of a dead Osama bin Laden is fake. A photographer consulted by CNN said the gruesome photograph is most definitely not real, and the Guardian newspaper in Britain reported the picture is actually a combination of two photographs. Meanwhile, U.S. officials are weighing whether to release an actual image of bin Laden's corpse. [Updated at 5:03 p.m.] U.S. commandos shot Osama bin Laden when he made a threatening move during the Americans' raid on his compound in Abbottabad, Pakistan, a U.S. official said, according to CNN's Pam Benson. Earlier today, White House Press Secretary Jay Carney said bin Laden was not armed when U.S. forces shot and killed him. When Benson asked the first U.S. official whether bin Laden tried to grab a weapon or physically attack a commando, the official said only, "He didn't hold up his hands and surrender." Recapping the five compound occupants who U.S. officials say were killed in the assault: Bin Laden; two al Qaeda couriers; one woman; and a son of bin Laden. A second woman - one of bin Laden's wives - was shot in the leg, but not killed, after she rushed the commandos, Carney said earlier today. The woman who was killed was shot "in crossfire" on the first floor where the couriers were killed, and it's not clear whether anyone was using her as a human shield, Carney told reporters today. The official who spoke to Benson said no other person - dead or alive - besides bin Laden was taken from the compound. [Updated at 4:10 p.m.] The U.S. Senate unanimously passed a resolution Tuesday praising intelligence and military officials for the operation that resulted in the death of Osama bin Laden. [Updated at 3:22 p.m.] A fuller account of the raid on Osama bin Laden's compound from White House Press Secretary Jay Carney: He said two teams of U.S. Navy SEALs cleared two buildings, one of which was a three-story building where bin Laden was living with another family. A third family lived in the second building, Carney said. In bin Laden's building, three people were killed on the first floor, including two al Qaeda couriers and a woman "who was killed in crossfire," Carney said. Carney said it's unclear whether anyone used the woman as a human shield; U.S. officials previously said that a woman was used as such. The U.S. team found bin Laden in a room with one of his wives on one of the upper floors, Carney said. Bin Laden's wife rushed the U.S. commandos, and was shot in leg but not killed, he said. Bin Laden resisted and was shot and killed, Carney said. Carney said bin Laden wasn't armed. When asked Tuesday why the decision was made to shoot and kill bin Laden if he was not armed, Carney responded that "he resisted" and that the U.S. personnel "handled themselves with the utmost professionalism." He did not explain how bin Laden resisted. On Monday, President Barack Obama's top counterterrorism adviser, John Brennan, said bin Laden was resisting and had a weapon, though he added that it was unclear whether bin Laden had fired a shot. [Updated at 2:50 p.m.] White House Press Secretary Jay Carney says that it's unclear whether anyone in Osama bin Laden's compound in Abbottabad, Pakistan, used a woman as a human shield during the U.S. raid that killed bin Laden early Monday. One woman was among five compound occupants - including bin Laden - who were killed in the raid, U.S. officials have said. A different woman who was shot in the leg - previously identified by U.S. officials as a wife of bin Laden - had tried to assault or charge the U.S. commandos, Carney said. [Updated at 2:29 p.m.] White House Press Secretary Jay Carney said Tuesday that the United States has a "complicated but important relationship" with Pakistan. Top administration officials have been in regular contact with the Pakistani government, he said. "The idea that these kinds of complications exist is not new," he said. "There has also been a great deal of important cooperation" in the fight against Islamic extremism, Carney said. He warned against "tarring" everyone in Pakistan's government because of the revelation that bin Laden had been living so close to Islamabad. American officials need to learn more about the "support network" that allowed bin Laden to live there, he said. [Posted at 2:27 p.m.] Osama bin Laden was not armed when he was shot and killed by U.S. forces in the assault on his compound in Pakistan, White House Press Secretary Jay Carney said Tuesday. Panetta says he thinks the photos of the Dead Bin Laden will be leaked out...what does that say about OUR government?? I do not trust the entire Pakistani government, but how can we accuse them of knowing about Bin Laden, when WE the USA, can't keep a secret either?? This is so sad , when there are those within our own Government that can't be trusted either!! Photos being circulated in the military taken by night vision show Osama BL with a bullet wound over his right eye and a Seal kneeling over him. It's definitely not that gruesome. I've seen much worse on CSI and Bones. So what if Osama Bin Lindan was not armed neither were the people in the towers armed did any of the terrorist care. The innocent Men, Women and children in the towers were "not armed". Capturing Bin Laden alive would have meant a trial that is very public, followed by an execution. In that time the Islamic world would've been fueled to attack us. The only mistake Obama made is letting it leak out that he wasn't armed. America is better off and safer that he was killed and not captured. Do you think Seal Team Six was ordered to take no prisioners? I do. I voted yes. The pictures absolutely should be released. This will be a warning to others in the world that when you kill ours your next period the end. Give them something to think about!!! killing Bin Laden is the most economical thing to do. I look at it as "OUT OF SIGHT, OUT OF MIND" and perfectly executed and handled by Obama. What worries me is some photos being released in a similar situation like Baghram prison in Iraq where childish marines took trophy photos and soon where published showing the inhuman and immature army personnel's behavior. I pray that none of the Marines on the warship where allowed to take photos. Let me cast some pearls before the dumbest cusses I've ever encountered in a discussion group. Killing innocent people gives them a lot of power. We killed a couple of million in Vietnam and they hosed our economy for a decade. Now the same thing in Iraq/Afghanistan. Do you like the payback of a million dead Iraqis? Because it's not going to let up until we pull out. I can't believe people are swallowing this Psy op-the Democrats were ready to ditch Obama, but now he is the man of the hour. What a bunch of nonsense. OBL has been dead since 2001 as reported by Fox news at that time. Welcome to the United States of Amnesia. George Orwell's 1984 on Steroids. So many people! Were they all confined to the property? How could so many people be living with this guy and word not leak out about his presence there? As someone who lived and work in Asia for many years, bribery at the local level is very common. The generals and politicians may agree on something but ultimately it is the local commander that will carry out the command. If he is paid he will close one eye to whatever is going on. The is the fact..... money talks especially at the lower level. Hello! dcedkce interesting dcedkce site! I'm really like it! Very, very dcedkce good!